We’ve gathered up the best cordless shavers for comparison. They cross the road between foil and rotary with the best of each coming out on top. You’ll likely have a favorite type, which is why we included both on this list. They have superior movement compared to some others. 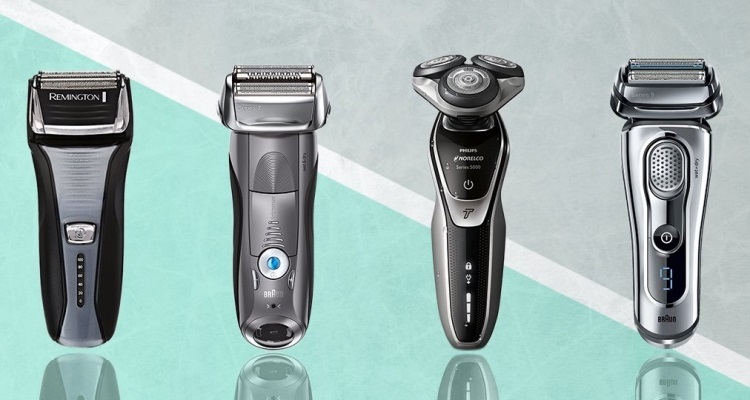 When choosing a cordless shaver, you’ll want to compare a few different aspects. The time it takes to charge is one. The other is the battery life itself. How long will the shaver stay charged? That’s a huge consideration if you’re traveling with this shaver. Other notable features would include whether it’s waterproof or has a charging and cleaning station. 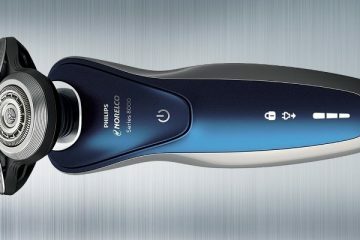 All of these features have been broken out into a top 5 list of the best cordless shavers out there. 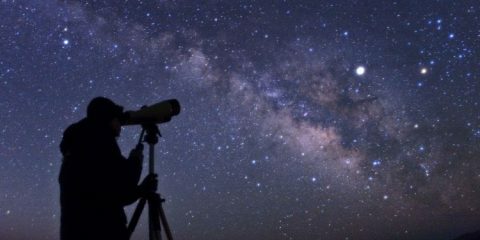 Take your time and read our guide to find the one that calls to you. The Series 7 790cc has 4 shaving elements for a really close shave. There are 3 cutting elements and a guard for the skin. The SkinGuard smooths the skin while the elements cut the hair. The Autosense technology has a motor that adapts to the thickness of your beard. It’ll deliver more power as needed. When it comes to a close shave, you need a shaving head that will move. It should move with the contours and angles of your face. 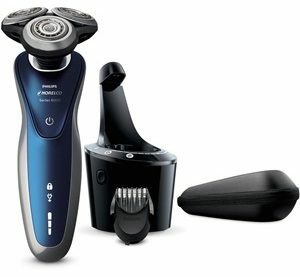 This shaver’s elements all move independently and the head itself adapts to the skin, too. Keeping the shaving elements from leaving the skin is how you get a close shave without irritation. Cordless shavers need to be waterproof, so you can take them into the shower. That’s the beauty of having a cordless shaver. This one can be submerged in water up to 5 meters. This means you can take it into the shower and give it a rinse under the faucet when you’re done. On the other hand, there’s a wonderful cleaning and charging station with this shaver. It’s able to clean, sanitize, lubricate, and charge your electric shaver in one place. You don’t have to do anything at all, either. Simply place the shaver into the docking station, and it’ll do all the work. The shaving elements are in a thin line that allow you to get even the hardest areas of the face like under the nose. It’s completely maneuverable due to the contouring abilities. Each shaving element moves independently to stay in contact with the skin. When the shaving elements stay in contact with the skin, you won’t miss areas. It’s when you miss areas that you end up with irritation. You’ll have to go over that area constantly to get the hair, and it’ll lead to bumps. The cleaning and charging station is a great addition to this shaver. Not all cordless shavers have a dock that will clean, sanitize, and charge. The shaver is 100 percent waterproof, and the charge will last for 50 minutes of shaving. Bringing the shaver into the shower cuts down on grooming time in the morning. It’ll speed up your morning routine. Cartridges for the cleaning station can be expensive. 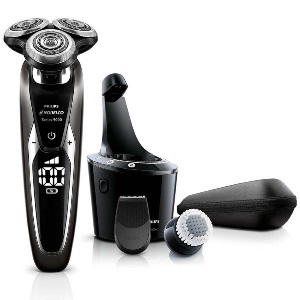 The 9700 has 3 rotary shavers that will actually move with the contours of your face. Each shaver moves independently from the next to ensure that you’ll cut more hair with a single pass. ContourDetect technology moves the shaver in 8 different directions. As far as the blades, the V-Track precision blades cut closer and self sharpen. This results in a shave that’s like new every single day. It’ll work with stubble as well as 3 day growth equally well. AquaTec technology means that you can use this shaver in the shower with shaving gel for an even smoother shave. On the handle, you’ll find comfort settings that allow you to choose modes from Sensitive to Fast. If a gentle shave is needed, the Sensitive mode is perfect. An everyday shave can be achieved with Normal. If you’re looking for a quick shave, you’ll be able to customize with the Fast setting. There’s also a battery indicator and replacement head indicator on the handle. The shaver comes with a cleaning system. This gives you the ability to keep your shaver in pristine condition over the life of the device. It doesn’t use alcohol, so you won’t have a reaction to the solution. It cleans and lubricates the shaver before charging, too. 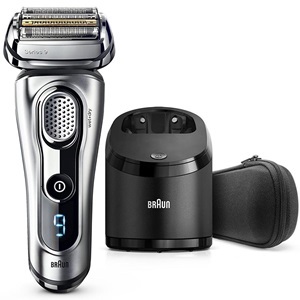 The 9700 is a shaver that can be customized to provide the shave you need on a particular day. This is where the shaver really shines. If you are running out the door, the Fast setting will get you on your way quicker. You might need a gentle shave, which is where the Sensitive setting will work best. You’ll get a powerful battery that will hold a charge for a full hour. It’ll also give you a quick charge if you need a fast shave without waiting an hour. A full shave is possible with a quick 5 minute charge. This is great for men who travel constantly. There’s also a travel lock indicator. This shaver comes with extras like the cleaning and charging station. As mentioned previously, the charging station will clean and lubricate the shaver. It comes with a cleansing brush for oil removal and deep cleansing for the skin. The shaver could benefit from a trimmer since there’s none included. The 9290cc has 5 shaving elements on the slim shaver head. There is a SkinGuard, specialized trimmers with a titanium coating, and 4 cutting elements. The shaver has Intelligent Sonic and AutoSense Technology. This helps you trap and cut more hair with every pass. Each of those cutting elements flexes and adapts to the contour of the face. With 5 elements moving side to side as needed, that gives you 10-D contouring. There’s not a hair that can escape one of the cutting elements or the special trimmers. The shaver is 100 percent waterproof, which gives you the ability to take it into the shower with you. It works in up to 5 meters of water. When you shave in the shower with foam or gel, you’re able to gain more time in the morning before work. Combining activities is an easy way to accelerate your morning routine. You can even rinse the shaver under running water. While you can rinse the shaver, it’s good to have a cleansing and charging station like this one. It’s the only 5-action charging station in the world. It’ll clean, lubricate, sanitize, oil, dry, and charge the shaver. You won’t have to do anything special. Just plug in the shaver to the docking station. The cleaning and charging station is quite impressive. You’ll be able to keep your shaver looking like the first day of purchase. When your shaver is kept clean, it’ll perform like new. The blades even self sharpen. While the cleaning and charging station is impressive, the shaving elements and movement are even more so. The specialized trimmers are covered with titanium, so they’ll never rust. The shaving elements move independently from the one next to it. This keeps the shaver in close contact with your face. The handle of the shaver has tons of information for you. The shaver will hold a charge for a good 50 minutes of grooming. The battery time will count down on the handle of the shaver. You’ll be able to see exactly how much time you have to shave. Replacement heads can be particularly expensive, but with the right amount of care, the heads will last for a long time. There are 5 foil-covered blades in this shaver. They are angled 30 degrees to ensure that hair is cut right at the base. There are different foil patterns that will lift and cut different hair types. For example, flat-lying hair is the focus of the various foils. The shave sensor active in this Arc5 can detect the beard density of the hair. When you have areas of thick hair, more power is directed to the shaver. In softer, thinner parts of the hair, the power is lowered to avoid irritation. With a pivoting head, the shaver will move back and forth. It also moves side to side to ensure that you’re getting a close shave without missed spots. Keeping contact with the skin allows the shaver to work the cheeks, neck, and jaw line. A single pass is all you need, and it’ll help you avoid irritation. After you’ve shaved your face, you can extend your grooming to cover sideburn detail, mustache trimming, and edging of a beard. There’s a precision popup trimmer on the side of the shaver. You’ll never lose the trimmer or have to hunt it down to quickly groom your handsome face. The 5 cutting elements that pivot and move will give you the shave you want. It’ll get as close to the skin as possible. There’s a Lift system that will guide and lift hairs to be cut in the sharp blades. It’ll gather more hair to be removed closer to the skin. The shaver is waterproof to be taken in the shower. This also makes it completely washable. It can be rinsed under a running faucet or placed into the cleaning system that’s included with this shaver. It’ll clean as well as charge, which keeps the blades in great condition. As far as accessories and extras, this one has the trimmer in the handle. The trimmer will never get lost or misplaced. Once the shaving is done, the trimmer can get to work on making you look sharp. The shaver is great for travel, too. It has universal voltage as well as a safety lock for travel. The shaving head can be difficult to move under the nose based on its size. One of the most important features in a shaver is the movement of the shaving head. It should move along the contours and angles of the face. Your cheeks and jaw are angled and rounded. The neck is an important part of the shaving process, too. This 8900 from Philips has three heads the move independently from each other. It moves in 8 directions for a close shave. The V-Track Precision Blades will line the hair into a great cutting position to get even stubborn hair. These blades are meant to get 30 percent closer to the skin without causing irritation. They’re engineered to self sharpen, too. This extends the life of your shaver. This is an entire grooming system that can give you a clean shave or a short beard. Stubble is a look that many men want. It looks rugged and handsome for many men, but you can’t allow it to grow out of control. There are 5 length settings built into the trimmer attachment, so you’ll only need one piece. The 8900 shaver comes with a SmartClean System that removes all the hair and foam or shaving gel from the blades. All you have to do is place the shaver into the dock where it’ll do all the work. It has a dual-filtration system that’s unique to this shaver. It cleans and lubricates using a solution that has no alcohol, so it’ll keep your face from becoming dry. When you can get a shaver with incredibly sharp blades, you’ll want to keep them in the best shape possible. These blades are meant to be at their best each and every day that you need to shave. This is done with the precision blades as well as the SmartClean system. The shaver has features that work on their own with little maintenance from the owner. The beard styler is fantastic for trimming and maintaining a certain look. A scraggly growing beard is never attractive. You can line and trim your beard as well as mustache and edges with this one piece added to your device. The combs of the trimmer won’t scratch or irritate the skin, either. There’s also an LED display on the handle. It’ll show you when it’s time to charge the device. This is a fast-charging shaver, too. 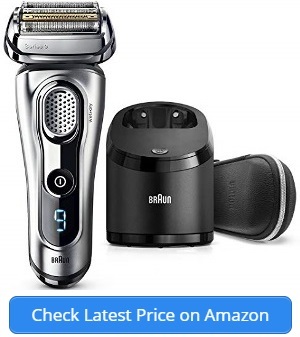 Once it’s charged for an hour, you have enough charge for weeks of shaving or trimming. There’s also a travel lock, so you can definitely take this styler on the road. Refills for the cleaning station can be an extra cost some customers don’t want. Whether you want a foil system or a rotary one, the movement is what matters. Any shaver that you choose should be able to follow the lines of your face. Your cheeks, jaw, neck, and upper lip have contours. The shaver has to follow those contours to get a close shave. When your shaver is unable to stay in contact with the skin, you’re going to have to make several passes. All of those passes lead to bumps and irritation. The shaver should get a close shave without causing bumps. The trimmers and shaving elements should be in a thin line that gets into many areas. The upper lip is an area that needs precision and the ultimate in control. It helps to have a shaving area that can easily move in and out of tight quarters. Consider the shaving area as well as precision and control when deciding on your cordless shaver. It should fit with your needs to ensure that you’re getting the best shave. Some men need a shaver that gives a good beard trim. Others need a precise line for sideburns or the back of the neck. This brings us to the trimmers and blades themselves. The blades should be self sharpening if possible. That means that the shaver’s life can be extended. Replacement blades won’t need to be purchased for a long time. The trimmers should help the blades do their work. The trimmers and guides will lift and angle all hair for cutting. If you’re plagued by flat-lying hairs, the guides and trimmers will have a bigger meaning for you. The shaver should be able to go into the shower. When you can combine activities in the morning, you’ll get out the door faster. A waterproof shaver can be used with foam or gel over the sink, too. You don’t always have to take the shaver into the shower with you. Softening the hair in a hot shower then shaving at the sink is a great option, too. Rinsing in the sink is easy with a waterproof shaver. It’ll keep hair and foam from drying and clogging the blades. Mention of cleaning brings us to the next point. The waterproof shaver can be rinsed in the sink easily. That’s not all the cleaning that is needed for the shaver. A docking station with cleaning, charging, and lubricating helps you maintain the shaver. It’ll clean all the hair and gel from the blades. It will also lubricate and keep the blades super sharp. Once it’s done with cleaning, it’ll charge the device for weeks of use. 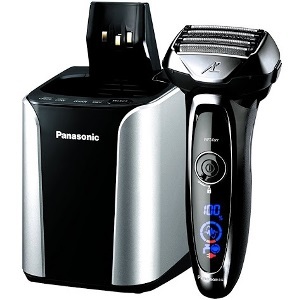 The charging process for the best cordless shaver should be simple and fast. You don’t want to find yourself staring at a dead shaver with a drained battery when you need a shave. It can ruin your entire morning. The charging should be as fast as possible, but that charge should last over a few weeks. The device should have an indicator for watching the length of the charge, too. You don’t want to be caught off guard. Most electric shavers have some kind of warranty and guarantee, so you don’t get stuck with a shaver that has a malfunction. Many great companies stand behind their products. They will replace or repair your shaver for a long time. The length of the guarantee will depend on the company, so make sure you’re comfortable with the length of time it’s covered. This should be done before you buy. An informed consumer is one that has done their research. A waterproof shaver can be taken into the shower. This means that your hands will be completely wet and potentially covered in shaving foam. Gel can also make your hands very slippery over the sink. The grip is vital to the welfare of the device. If you drop the shaver into the sink, you can break it. That is something that likely won’t be covered in a warranty. You’d end up with a broken shaver. Frustration and annoyance should be avoided by picking a shaver with a rubber grip and ergonomics that make the shaver comfortable and easy to hold. The best razor is one that can travel with you. It will have a travel lock, long battery life, and a case for keeping it safe from breakage. It’ll be waterproof for use in the shower and quick rinsing for cleanliness. We’ve gathered up the best of the best for you. 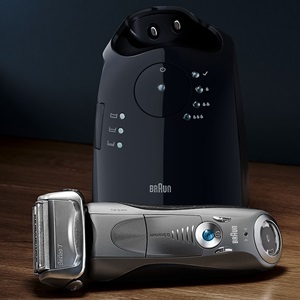 Among these cordless shavers, you’ll definitely find one that fits with your needs. They have some fantastic features like movable shaving elements, guides, and trimmers.